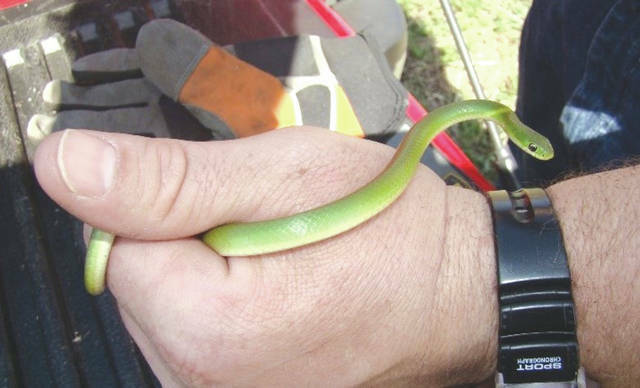 Submitted photo This Smooth Green Snake was found on base during an environmental survey in 2010. The survey team said it was the first documented SGS here since 1871. This Eastern Spiny softshell turtle was crossing the street to the golf course on Spruce Way. WRIGHT-PATTERSON AIR FORCE BASE — It’s a given that base personnel, both military and civilian, are the military’s greatest assets. However, according to Darryn Warner, 88th Civil Engineering Group, natural resources program manager, and William Williams, 88th Civil Engineering Squadron, pest control manager, there are some important wildlife, snakes and insects that call Wright-Patt home, and they play an important role in balancing the ecosystem. Additionally, while driving, walking or running on base, one might come across at least two species of turtles. There’s the snapping turtle and the Eastern Spiny Softshell turtle. These two turtles help balance the aquatic environment, because they are scavengers. Adding to the myriad wildlife and reptiles, there are many different species of insects at Wright-Patterson. One species in particular is the wheel assassin bug, who are true predators, yet beneficial bugs because they eat pests (and beneficial critters too). Even their nymphs deliver a bite that will bring a person to their knees or the nearest emergency room. As an example of the pain inflicted by the wheel bug, a coworker who had been warned about gardening without gloves was bitten by one at her home, and she described the pain as feeling like she was being burned or cut. It was like nothing she ever felt before while she screamed and writhed in her yard. Warner mentioned that there are also snakes on Wright-Patt. The Eastern Massasauga rattlesnake (EMR) is venomous and can be found throughout most of the Great Lakes regions of Ohio and are listed as endangered by the State of Ohio. “They are approximately two to three feet long with thick gray bodies, and they have a row of large rounded spots down their back and small rattle on the ends of their tails,” said Warner. “Residents in base housing can, however, put up bird feeders,” said Warner. For more information about wildlife on the base, contact Darryn Warner, 88th Civil Engineering Group, natural resources program manager at 937-257-4857.
https://www.fairborndailyherald.com/wp-content/uploads/sites/50/2018/06/web1_smoothgreensnake.jpgSubmitted photo This Smooth Green Snake was found on base during an environmental survey in 2010. 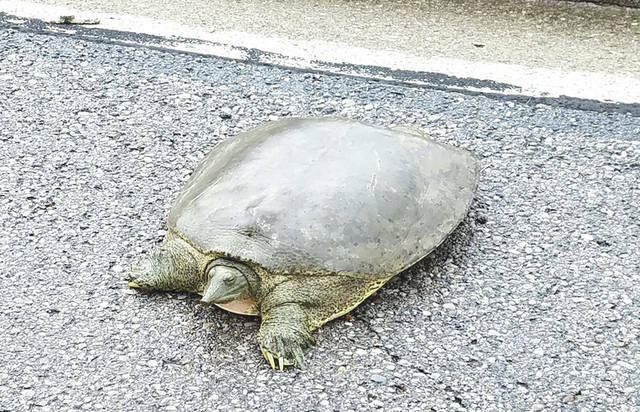 The survey team said it was the first documented SGS here since 1871.
https://www.fairborndailyherald.com/wp-content/uploads/sites/50/2018/06/web1_turtle.jpgThis Eastern Spiny softshell turtle was crossing the street to the golf course on Spruce Way.